Backyard Brains started off in a basement with a vision to make neuroscience technology just as accessible to children as buying a space telescope. Today, they have already developed affordable neuroscience experiment kits for students of all ages to learn about electrophysiology. These experiment kits show the hidden messages in our nervous system by teaching the intercellular electrophysiology of humans through plants. Plants don’t have brains, but they have the same ability to communicate with electricity like humans, just with different ions. 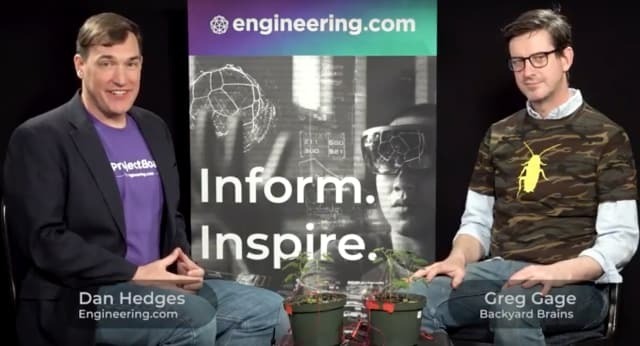 In a sit-down with Engineering.com’s Dan Hedges, Backyard Brains’ co-founder, Greg Gage, demonstrates how plants communicate through neuron impulses with one of their tools called the SpikerBox. The SpikerBox was the first product ever developed by Backyard Brains. It uses plants to show how cells in the brain communicate to facilitate activity and movement. The SpikerBox records electrical signals or neurons of the plant’s muscles when triggered by stimuli. Gage demonstrates how the SpikerBox works with the Mimosa pudica plant and a Venus flytrap. In the video, Gage explains how plants have behaviors that are similar to humans. While plants don’t have brains, they do have the ability to send messages throughout their body with electrical impulses—just like humans. According to research studies, one in five people are likely to develop a neurological disorder. By making neuroscience research equipment available for middle schools and high schools, you no longer have to be a graduate student at the university to study the brain. Backyard Brains aims to encourage breakthroughs outside the PhD lab and into kids’ hands through these tools. Besides the SpikerBox, they have a whole line of neuroscience experiment kits and lesson plans that students, teachers and amateur scientists can purchase on their website. They also hold DIY workshops where community members can build their own tools with the Backyard Brains team. For more information, check out their website here.